1). A molded projection that crowns or finishes the part to which it is fixed. 2). A mould of wood or plaster that is fixed to cover the internal walls to ceiling joints. US. Crown mold. 3). The exterior trim to a structure mostly at the meeting of the wall to the roof. Mostly masonry as in classical architecture but also timber. 4). 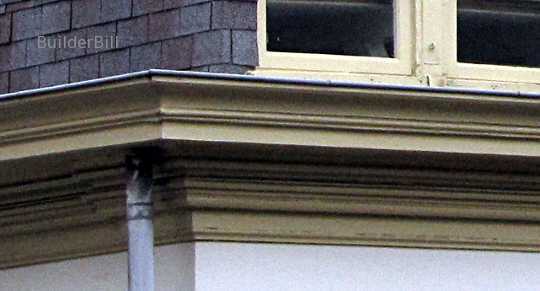 The moulding forming the top member of a window or door frame. 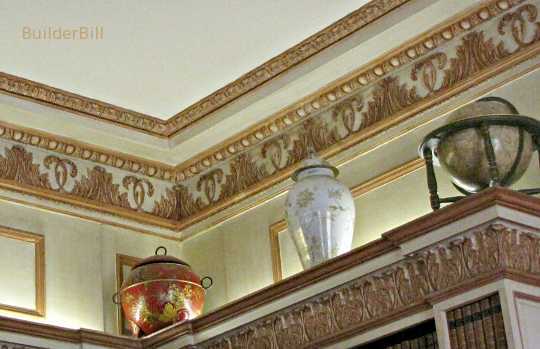 A quite ornate plaster-cornice that is quite at home in a room that has a ceiling height of about 3300 or 11 ft. 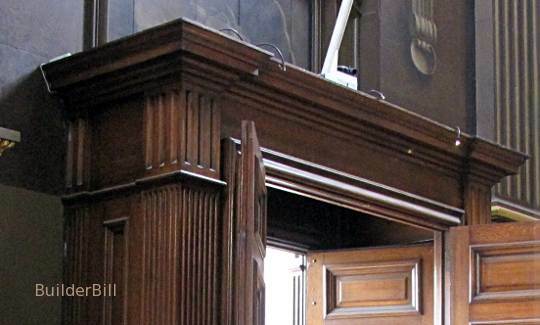 The size of these mouldings ideally should be related to the size of the room. In average homes we start off with the humble 55mm or 2-1/4" which is the size that is by far the most popular. Then they go up to ones in the photo that are custom made for the one job. The term can just about be interchanged with crown mold, but it does seem now that the trend is towards crown mold to be timber and cornice to be plaster for internal work.